The basket can be installed in two different positions: for frying and draining. Patented oil filtration system keeps the food both healthy and tasty. The construction is a little bulky. Premium deep fryer for high demands of productivity, design fanciness, and healthy lifestyle. Maximum convenience for a user from a small utensil. Thanks to digital controls, you can easily set the temperature by pressing a button. Then the timer will beep to let you know when it is ready to go. This professional deep fryer made of stainless steel can satisfy any possible needs. A set of useful features makes this product hard to fault. Cool-touch sides stay room temperature. The cord is magnetic and can be quickly attached or detached. Decent heat up time, basket lift with lid down. It's got neither timer nor filter. The best choice of the deep fryer when financial resources are limited. The producer provides reliable quality for small amount of money. 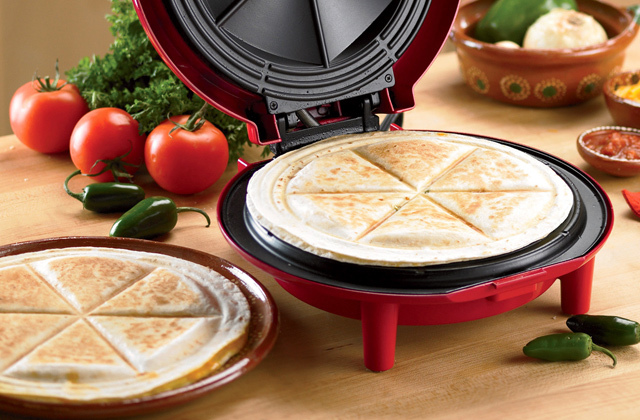 It has a very compact size and can cook a great amount of food with only 2 quarts of oil. Owing to a carbon filter, it reduces oil and food smell. Lid pops up very abruptly. Optimal solution for home or travelling usage. The item is compact and reliable, when the budget is limited. Patented oil drain system makes the cleaning process really easy. You will be able to drain not only oil but also water after cleanup. The window might fog up when frying food from frozen. This fryer is great for a small family as it easily makes dinner for 2-3 persons in one fell swoop. Its unique rotating basket helps achieve crispier and healthier meals. Wow! This thing can really fry! Chicken wings, French Fries, Eggrolls, Doughnuts, Jalapeno Poppers, Cheese Curds, Steak Nuggets, Beer battered Halibut...Everything you want! T-fal Deep Fryer is not a very big kitchen helper that has an average oil pot capacity - 3.5 liters. 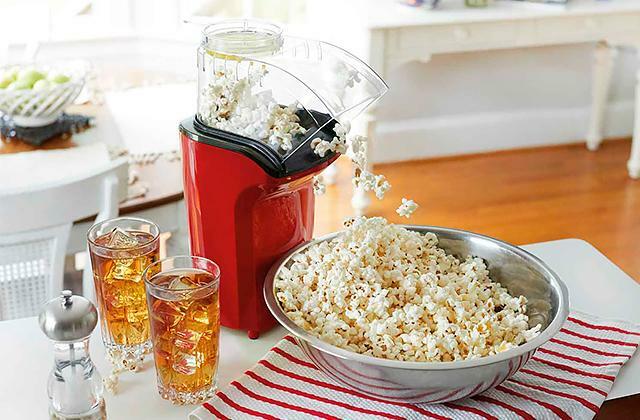 Such capacity will allow you to prepare 4-5 servings of tasty crispy food in one fell swoop. So, you are welcome to turn the deep frying into a cinch! 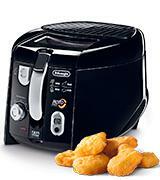 T-fal FR8000 Deep Fryer can solve every problem you may have with frying as it is extremely powerful ( 1700 Watts). The heating element of this deep fryer is immersed and it heats up pretty quickly and gets to the highest temperature (374 F) well. For instance, 12 minutes will be enough for preparing 5 servings of fries. 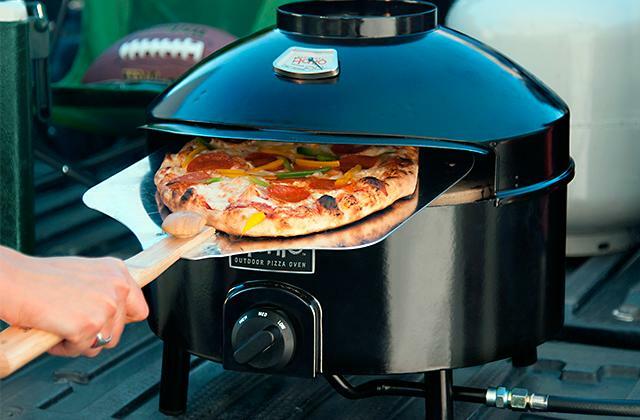 Customers claim that it works like a real champ and even deep frying of frozen foods is a breeze. This model is made of stainless steel and it means that it will serve you for long years. Internal parts are also made of steel. So, clean up is great as well because you can put almost all the pieces (main oil bowl, plastic oil-saving box with lid, lid, basket) in your dishwasher. The heating element is also removable. Hence, it can be easily cleaned with hot water and a sponge. T-fal FR8000 has the unique Easy Oil Clean-up oil filtration system paired with oil drainage system. This system works well and creates no mess. Moreover, the device is also equipped with odor filters that absorb frying smells. A top-notch device! It is an easy breezy fryer not only in a cleanup but also in a setup. Assembly is really easy and takes little time. As for extra conveniences, this Tefal deep fryer is equipped with simple mechanical controls. The benefit is that the heating temperature can be adjusted in Celsius and Fahrenheit. So, this model is ideal for worldwide use. There's also a big viewing window in a lid, so you can control the cooking and stop frying when it's enough. Furthermore, since this fryer has small rubber feet, it is easy to move around. The overall look of the device is a candy. It looks stylish and modern. Waring Pro DF280: 11 in. Hamilton Beach 35021: 11.38 in. Presto 05443 CoolDaddy: 10.75 in. I purchased T-fal’s FR8000 EZ Clean 3.5 Liter Oil Capacity Stainless Steel Deep Fryer with Professional Immersion Heating Element and Unique Filtration System at full price and am reviewing it of my own accord. All in all, I think it is a great fryer and would definitely recommend it. 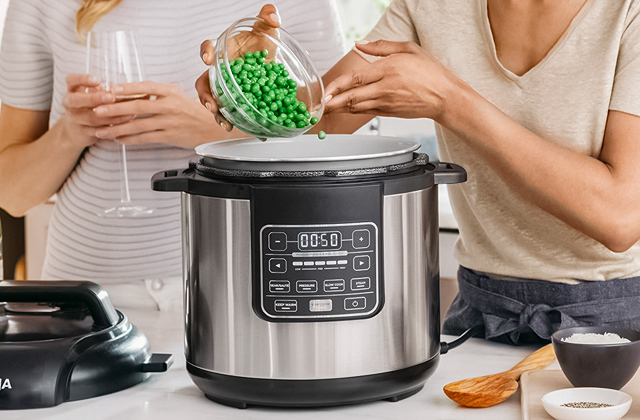 All in all, this is a good buy for someone who is not much of a cook, who has to feed at most 3 people, or someone quite busy and multi tasks a lot. Most meals can be completed in 30 mins. Everything but the power cord and the heating element/control unit can go into the dishwasher! If you have a legendary love of crispy French Fries or Buffalo Wings, let us tell you that you will not be able to make decent dishes on a grill or in an oven. But, Waring Pro DF280 easily copes with this task. This little fryer is able to produce restaurant quality food! It goes with one large and two small mesh baskets. The capacity of oil pot is 3.7 liter. So, an average capacity of its bowl and large baskets will allow you to deep fry up to 6 servings of tasty and crispy French fries, mozz sticks, buffalo wings, onion rings, corndogs, cheese sticks and more. 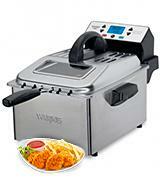 Waring Pro deep fryer has a removable 1800-Watt immersion style heating element. As this deep fryer is an extremely powerful device, it can heat up the oil to a maximum temperature very quickly. Just imagine, this fryer comes up to 375 F temperature in about 15 minutes (from room temperature). Hey, it is able to out-fry even restaurants in terms of quality! 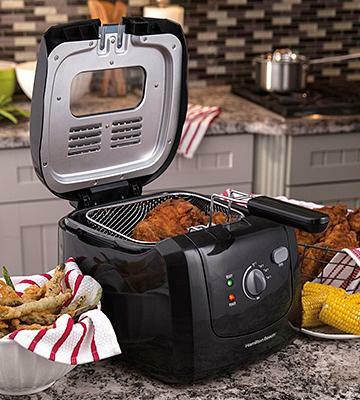 So, if you love doing a fried food smorgasbord, this deep fryer will be the best option. You will surely be elated at this wonderful device! This stainless steel fryer looks absolutely stellar on any counter-top. Moreover, it is very easy to clean as it contains a removable bowl and a removable lid. So, you can rinse them under running water or in the dishwasher. But the same doesn't go for its removable heating element. It is advisable to clean it with a sponge. Probably, the only disadvantage of this model is that it does not have filters. But, frankly speaking, it is not the reason to stop considering this fryer as everything that you will fry in it will come out delicious and crispy! Oh yeah! This is the best deep fryer for its price range. Waring Pro DF280 has a convenient 60-minute timer and an adjustable temperature control. Its display shows the precise temperature as it is heating up. Hence, you will be able to set the exact temperature of the heating element and cooking time. A big viewing window in the lid allows the user to watch and control the cooking process. To sum up, as far as home deep fryers go, this one is definitely a winner! Also, love the large capacity of oil it will hold, can dump a whole gallon in there! Other than the size, it's a good fryer. I can drop a ton of stuff in there and the temp doesn't drop. It comes with three baskets but I've never used anything other than the big one. Timer is a great addition so I don't have to use the oven timer. At first, you may think that the basket is not so huge. But, that is not so. It can hold a pretty big amount of different delicacies. 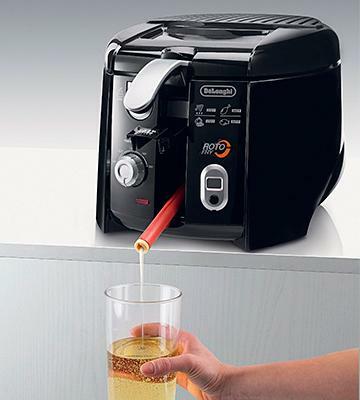 Hamilton Beach deep fryer can prepare up to 4 servings of French fries, or 3 servings of chicken legs at one go. Its oil pot capacity is 2 liters. So, this model will be an excellent option for a small family or a small company. What is more, due to the square basket, you can easily cook a whole catfish in this fryer. Perfect! The power of Hamilton Beach 3502 is 1400 watts, and this is enough to heat up oil in a short time. 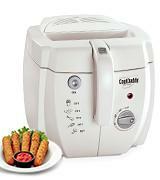 Moreover, this deep fryer is equipped with a magnetic power cord that can be quickly detached to turn the device on/off. As for the maximum temperature, it is 375 F. So, this item doesn't stand out among its rivals. 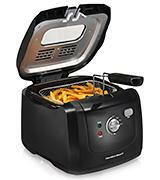 All in all, if you purchase this Hamilton Beach device, the deep frying will be a breeze! 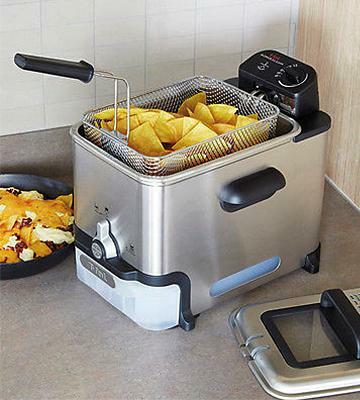 This fryer will definitely meet your expectation and become a hit in your home! It works great and is very easy to clean. You will be able to wash the non-stick bowl and lid in the dishwasher. As for the heating element and the control unit, it is desirable to take them off and wipe off dirt and grease with a sponge or wet cloth. Besides, you can easily detach Breakaway magnetic power cord for a total cleaning. Fantastic! The manufacturer is really concerned about customers' safety, so this unit has Cool-touch sides. Thus, you or your children will never burn hands in case of accidental touch. In addition, you can fry the food with the closed lid so as to reduce spattering. Moreover, you can also lift a basket with already cooked meals for draining oil while lid is closed. The viewing window will allow you to control the cooking process. To cut a long story short, this is a win-win device with a great variety of extras. Waring Pro DF280: 18.5 in. 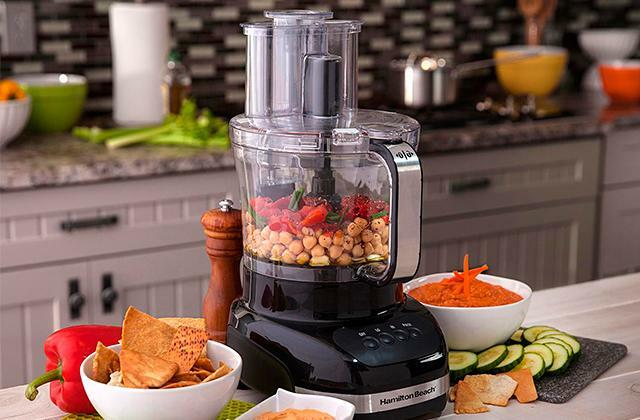 Hamilton Beach 35021: 13.94 in. Presto 05443 CoolDaddy: 15 in. A bit small in capacity, but cooked up to 6 wings at a time quickly. It does it's job extremely well. Heats up fast and the cover keeps spatters to a minimum. Love the fact that you can see the food as it cooks and you don't have to open the lid to let the fryer basket drain. So easy ro dump and clean and not so many controls as other brands. Simple but does the job. It's the perfect size for storage on or above our kitchen counter. Short money for a mini deep fryer. This Presto fryer may seem small at first glance, but the capacity of its oil bowl is 2 liters. So, it will be enough for cooking 4 servings of tasty crispy food. Moreover, owing to a round shape, you can load even a whole chicken into a basket. To sum up, if you are looking for a fryer to get crispy delish food (like shrimp, chicken, French fries and more) for two-four persons in one fell swoop, this is exactly what you need. This is a really powerful little fellow with a perfect size for small cooking jobs. The power of this model is 1500 Watts. So, the oil in the bowl is heated to the set temperature in a short period of time. Customers claim that it heats up to the maximum temperature (375 F) just in 7 minutes. Wow! So, it saves your time, oil, and electricity. 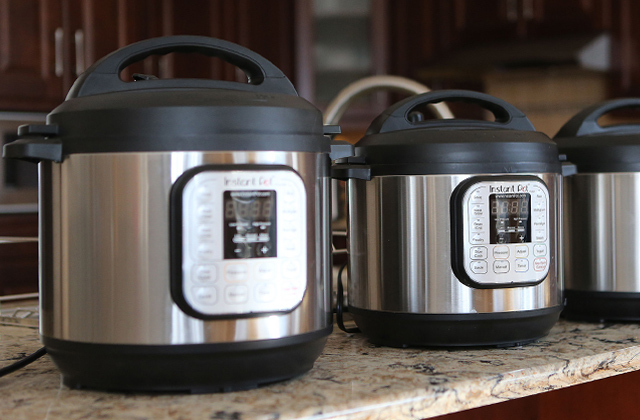 Our verdict - Presto deep fryer will allow you to cook food quickly and easily. This is a quite compact deep fryer, it has the following dimensions: 15 x 10 x 9 inches. So, its clean up is a breeze. Everything but the control unit/heating element and the power cord can go into the dishwasher! Thanks to a carbon charcoal filter that absorbs frying odors, you will not feel the smoke and strong grease odors when cooking. Overall, its price is great, durability, size and quality spot on. Presto deep fryer was built with cleanliness in mind. 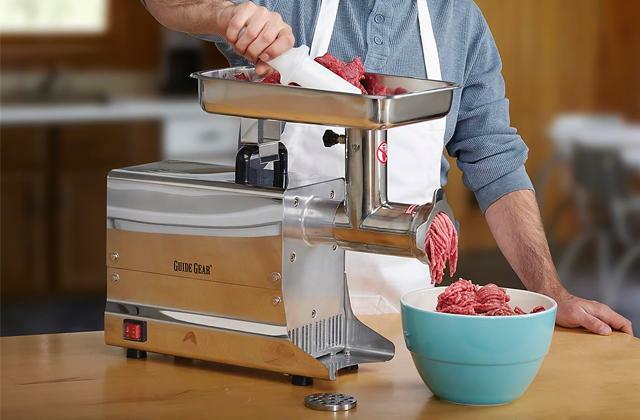 It has adjustable mechanical controls that are really easy to use. Moreover, the fryer is equipped with a handy indicator light that signals when the oil is ready for frying. As for design, there's an extra-large viewing window to control the cooking process. In addition, the exterior basket handle lowers the baskets with food into the oil with the lid closed to prevent splashing and spattering. No more burns! And, finally, the pot has a nonstick coating which prevents sticking of food to the bowl. Good additional features for an inexpensive deep fryer! Waring Pro DF280: 13 lbs. Hamilton Beach 35021: 8.8 lbs. Presto 05443 CoolDaddy: 6.88 lbs. This one is amazing, temperature can be set and controlled, which the other one had no control, the whole oil pot lifts out for discarding the oil and/ cleaning, no fuss, no mess. We used it and it works great and is visually appealing, plus all the features are great. There is a button to open the lid for placing and removing foods into the stainless basket. This fryer is very attractive in our Kitchen, it fits well with the rest of our apppliances and its ease of use and the window to view is very easy to operate. This deep fryer is definitely not designed for the intense use. But it is ideal for 2 or 3 people as its oil pot capacity is 1 liter. So, it is enough for 2-3 servings of delicious french fries, fried chickens, mozzarella sticks, and even fried ice cream. The big advantage of this deep fryer is that you are able to cook food without a basket because a heating element is hidden under the frying bowl. Thus, you can easily deep fry the whole chicken without placing it in the basket. But still, if you want to use a basket, you will be pleased to know that this fryer is equipped with a unique rotating basket for frying crispier and healthier food. Oh, this is the best fryer for spur-of-the-moment meals and snacks. The heating-up time is just 5-6 minutes. It has a 1500-Watt heating element with a temperature range of 300-370° F! The adjustable thermostat has an indicator light that always shows you the current temperature. And don't worry about over-frying. You can set a digital timer and an audible alarm will alert you when it's time to check on your meal. 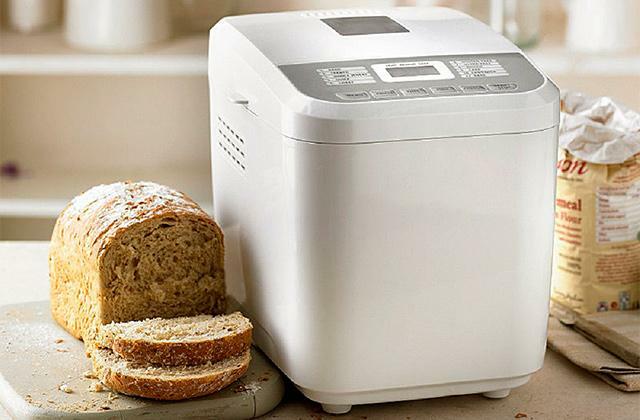 There are so many good things to say about DeLonghi deep fryer! Its housing is made of sleek plastic. 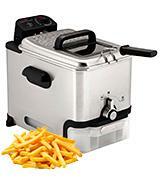 Hence, the fryer is very modern and looks fantastic on any kitchen counter. A removable bowl is also very durable as it is made of Teflon. So, it goes without saying that the pieces of food won't stick to the bowl. Thus, its plastic exterior and non-stick Teflon interior make the device REALLY simple to clean! But, that's not all. A unique patented oil draining system will simplify cleanups greatly. Just pull out a special hose (stored in the front) and drain the oil or water. 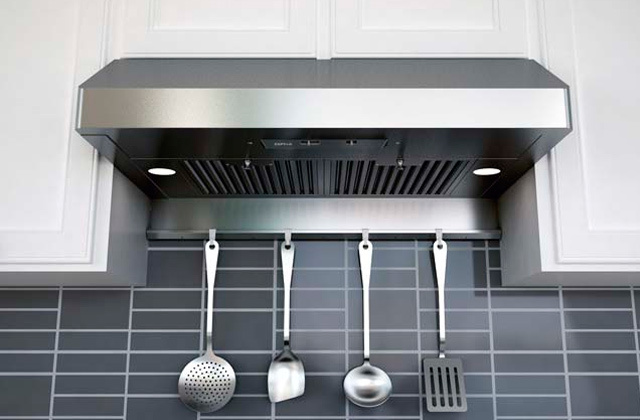 The dual filter system prevents oil vapors and odors from lingering in kitchens. 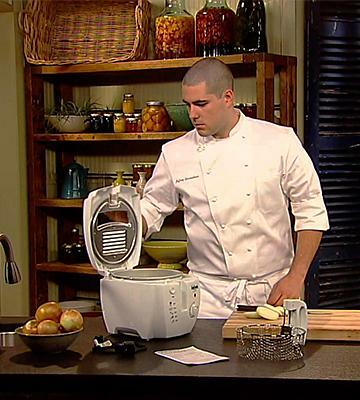 Overall, we recommend this deep fryer with 100% confidence. 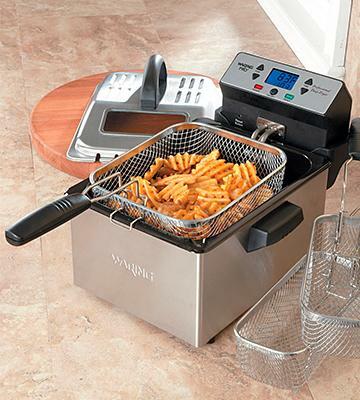 Probably, this is the best safe fryer that can be used even by teenagers who can't live without french fries. First of all, its heating element is hidden under the bowl, so there is no possibility of accidental touch. Secondly, cool touch exterior walls prevent any burns. Next, the lid is not heavy and also comes with a cool-touch handle, so openings/closings are safe and easy. Moreover, this lid is equipped with a viewing window (to control the frying process) and the dual filtration filters to absorb the "deep fry" smell. Concerning controls, this fryer comes with a digital removable timer that alerts users to check on food in time. Super! Waring Pro DF280: 12.25 in. Hamilton Beach 35021: 8.58 in. Presto 05443 CoolDaddy: 9.12 in. Even the basket is easy to clean. Extra great for Chinese cooking with lots of quick frying. Perfect for my uses. This fryer is light weight and effective. It is easy for me to move from one location to the next, even with the oil inside! I wish it had a on/off button and the timer thing is cheaply made. You also have to be a bit careful with the lid as it tends to pop up with a bit for force. The device appears to be a good bargain, reasonable price and performance, again short-term experience. The temperature controller is a nice feature! If you are a creative cook who likes restaurant-style French fries, chicken wings, and other crispy fried foods, you should definitely opt for a Deep Fryer. 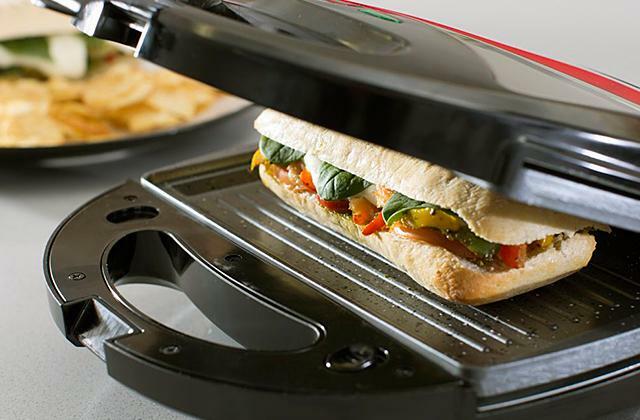 It is a simple kitchen appliance which significantly facilitates the process of deep frying. 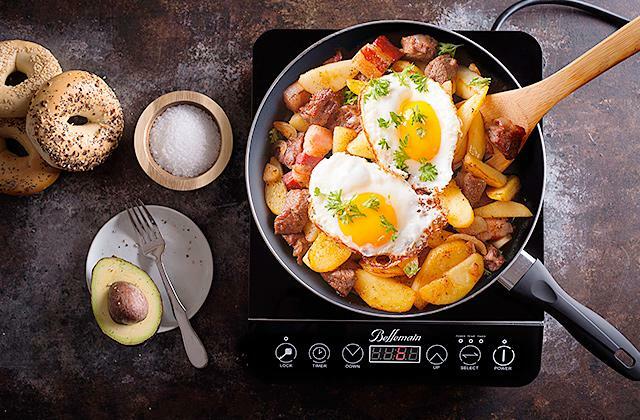 Moreover, it cooks much healthier food in comparison with pans. To specify, the food contains less cholesterol. The secret is that at high temperatures the food does not absorb the frying fat. This frying fat only envelops the food, forming a crispy crust that is so "hot" among adults and children. But the abilities of deep fryers are not limited only to the famous French Fries or chicken wings. You can deep fry almost anything! Vegetables, cheese, poultry, meat, seafood, fish, fruit? No problem! But if you want to cook healthy and nutritious food without oil, then our suggestion is to pay attention to Air Fryers. Probably the most important feature to pay attention to is an oil pot capacity. The pot can contain from 0.5 liters to 5 liters of oil. It goes without saying, that the greater the capacity of the pot is, the more servings you can dish up. For example, if you want to deep fry 5 servings of French fries, it is advisable to choose a model with a 2.2 - 3 liters pot capacity. As for the shape, a pot can be circular or square. Respectively, a mesh basket for ingredients (which is immersed in an oil pot) will also be of the same shape. Note that if you plan to cook various meat or fish dishes, you should choose a square deep fryer in order that loaded food does not lose its shape. The next point to consider is a special non-stick coating. It is a great bonus as a non-stick pot prevents burning. The sooner you can get to frying, the sooner you can get to eating. And it is the power that predetermines the cooking time. Pay attention that the fryers with little oil pot capacity (for example, 1- 2 liters) do not require high power (800- 1500 Wats will be enough). On the contrary, if the capacity is more than 2 liters, it is advisable to consider 1500-1800-watt devices. 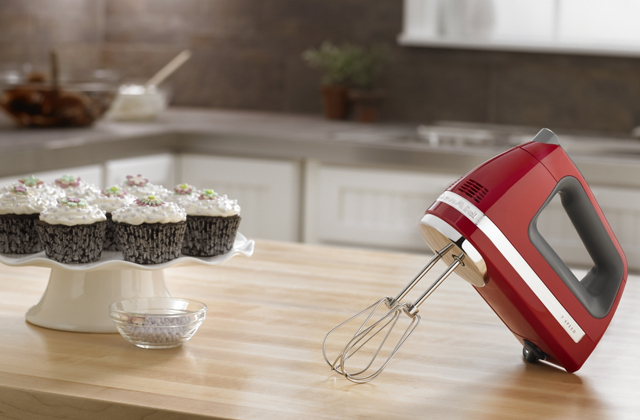 Every kitchen appliance requires care and cleanup. So, removable parts are a great advantage. Moreover, some models have a removable pot which can be even washed in the dishwasher. As for the main heating element, there are models with immersed or non-removable ones. Consequently, deep fryers with immersed heating elements can be washed under running water. As for the models with non-removable heating elements, it is advisable to wipe them with a sponge. Some fryers have a unique feature "cold bottom" which helps reduce the temperature of the bottom and prevent food from burning. The process of cooking is always accompanied by the release of odors and smoke. Thus, manufacturers equip almost every fryer with special filters in order to avoid spreading of odors around the kitchen. Such filters may be removable or non-removable, as well as single-layer and multilayer. The most effective ones are multilayer carbon filters which have several protection layers. Furthermore, if you plan to use the fryer constantly, we suggest paying attention to models that have oil purification filters. These filters will allow you to use the same oil 10 times and, accordingly, will greatly save your money. The next important features to pay attention to are Operation and Conveniences. These two options may significantly affect your choice. For example, some models are equipped with digital displays in order to control modes, temperature and cooking time. Whereas, there are models with mechanical control type. Considering mechanical models, you can only set the oil heating temperature. What is more, some deep fryers are paired with a special timer that will let you know when your dish is ready. How does it work? The fryer will beep and shut off the heating element. For those who like to watch the cooking process, most models have a viewing window in the lid. So, having found out what to look for when choosing a deep fryer, we hope that you will find the best model according to your purposes. Good luck! 1. Kristen Buk Deep Fryers Review, TopTenReviews. August 5, 2016. 2. Kristen Hicks How to Choose the Best Deep Fryer, CompactAppliances. March 21, 2016. 3. How to Buy a Deep Fryer, ConsumerSearch. November 2015. 4. Deep fryer, Wikipedia. July 30, 2016. 5. How to Deep Fry at Home, WikiHow. 6. Chef John Chef John's French Fries, Allrecipes. 7. Rebecca Rupp Are French Fries Truly French? National Geographic. January 8, 2015. 8. How to Clean a Deep Fryer, How To Clean Stuff.net.